Twenty-seven chemical elements are considered to be essential for human life. Now there is a 28th — bromine. 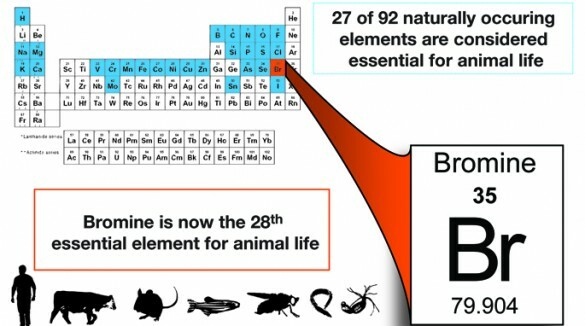 In a paper published Thursday, June 5, in the journal Cell, Vanderbilt University researchers establish for the first time that bromine, among the 92 naturally occurring chemical elements in the universe, is the 28thelement essential for tissue development in all animals, from primitive sea creatures to humans. The researchers, led by co-first authors Scott McCall, Christopher Cummings, Ph.D., and Gautam (Jay) Bhave, M.D., Ph.D., showed that fruit flies died when bromine was removed from their diet but survived when bromine was restored. This finding has important implications for human disease. 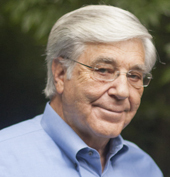 “Multiple patient groups … have been shown to be bromine deficient,” said McCall, an M.D./Ph.D. student. Bromine supplementation may improve the health of patients on dialysis or total parenteral nutrition (TPN), for example. The report is the latest in a series of landmark papers by the Vanderbilt group that have helped define how collagen IV scaffolds undergird the basement membrane of all tissues, including the kidney’s filtering units. Hudson said the foundation for the discovery about bromine goes back 30 years when he was at the University of Kansas Medical School. Curiosity about two rare kidney diseases led, in the mid-1980s, to the discovery of two previously unknown proteins that twist around each other to form the triple-helical collagen IV molecule, like cables supporting a bridge. Disease results when these cables are defective or damaged. Hudson moved to Vanderbilt in 2002. In 2009, colleagues led by Roberto Vanacore, Ph.D., assistant professor of Medicine, reported in Science magazine the discovery of a novel sulfilimine bond between a sulfur atom and a nitrogen atom that acts like a “fastener” to connect the collagen IV molecules forming scaffolds for cells. A defective bond may trigger the rare auto-immune disease Goodpasture’s syndrome. The disorder is named for the late Vanderbilt pathologist and former medical school dean Ernest Goodpasture, M.D., who was best known for his contribution to the development of vaccines. That discovery led to simple question: how is the bond formed? In 2012, Bhave, assistant professor of Medicine, Cummings, now a postdoctoral fellow, and Vanacore led the effort that found the answer — the enzyme peroxidasin. Conserved across the animal kingdom, peroxidasin also may play a role in disease. An overactive enzyme may lead to excessive deposition of collagen IV and thickening of the basement membrane, which can impair kidney function, they reported in the journal Nature Chemical Biology. In the current study, to which Vanacore and Andrea Page-McCaw, Ph.D., associate professor of Cell and Developmental Biology, also contributed, the scientists demonstrated the unique and essential role for ionic bromide as a “co-factor,” enabling peroxidasin to form the sulfilimine bond. The chemical element bromine is thus “essential for animal development and tissue architecture,” they report. The study was supported in part by National Institutes of Health grants DK018381, DK100094, GM007347, DK097306 and GM073883.